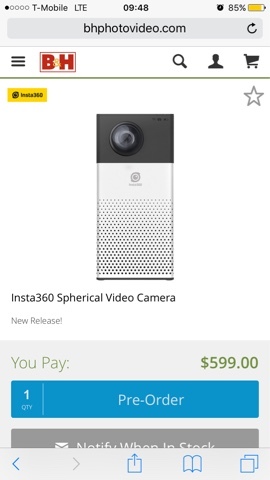 The preorder price of the Insta360 4k camera dropped from $899 to $599 at B&H Photo! This makes the Insta360 4k the most affordable 4k 360 camera at the moment. However, it faces competition from the LG360 ($200, 2k video), Samsung Gear 360 ($350, almost 4k 3840×1920), and even Insta360’s own upcoming Nano ($200 or less, 3k video).